Designed to deliver the power and precision demanded by the most committed all-mountain skiers, the new RX 100 LV offers a racing pedigree with a more inclusive high-performance fit. Lange`s new Dual Core shell construction and Dual 3D liner integrate perfectly, ensuring unparalleled foot-wrapping, precision, and power transmission. 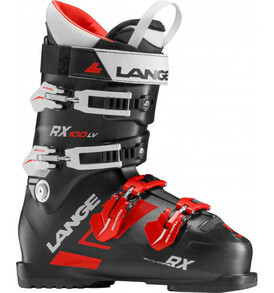 The new RX specific fit retains Lange's strong heel lock and foot hold with more instant "out-of-the-box" comfort. Lange`s new DUAL CORE construction targets softer and more rigid durometers of ultra-lightweight Grilamid® plastic to key areas of the boot to enhance performance and entry-and-exit, resulting in a sandwich shell construction that increases energy, rebound, and flex control. DUAL 3D LINERS are pre-shaped to match the inner shell for the most precise and accurate power transmission, and around the foot for the most comfortable anatomic fit. The DUAL 3D SPORT version is 60% thermo-formable (shin, ankle, instep, toe box) with low-density foam integrated in key fit zones for enhanced comfort and support. Replaceable MONO MATERIAL TOE and HEELS can be updated when worn for longer boot life. FLEX ADJUSTMENT via removable rear cuff screws allows easy customization for enhanced comfort and performance. Home Products RX 100 LOW VOLUME boots RX 100 LOW VOLUME ALL MOUNTAIN PISTE RX 100 LOW VOLUME ★★★★★ No rating value Write a review . This action will open a modal dialog. Ask a question Designed to deliver the power and precision demanded by the most committed all-mountain skiers, the new RX 100 LV offers a racing pedigree with a more inclusive high-performance fit. Our new Dual Core shell construction and Dual 3D liner integrate perfectly, ensuring unparalleled foot-wrapping, precision, and power transmission. The new RX specific fit retains Lange's strong heel lock and foot hold with more instant "out-of-the-box" comfort. last 97 mm flex index 100 DUAL CORE Our new DUAL CORE construction targets softer and more rigid durometers of ultra-lightweight Grilamid® plastic to key areas of the boot to enhance performance and entry-and-exit, resulting in a sandwich shell construction that increases energy, rebound, and flex control. LINER DUAL 3D LINER SPORT DUAL 3D LINERS are pre-shaped to match the inner shell for the most precise and accurate power transmission, and around the foot for our most comfortable anatomic fit. The DUAL 3D SPORT version is 60% thermo-formable (shin, ankle, instep, toe box) with low-density foam integrated in key fit zones for enhanced comfort and support.